Exit Fate is a new RPG game from Origami, creator of the well-received RPGMaker effort entitled Last Scenario. Note that it isn't the full game but a partial demo, hence most players can expect to complete it in an hour or so. Press the alternate and Enter key to switch between full screen and windowed mode. 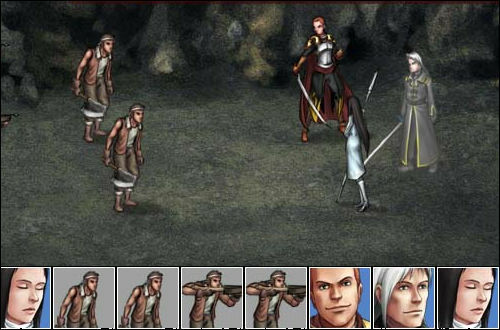 The game not only features standard 2D encounters but boasts a tactical strategy mode as well, in which the player must assume control over legions of troops, issue commands and lead their armies to a crushing victory. Bonus items are awarded for good results, especially if the battle ends quickly with minimal losses to your side. A new addition is the bribe system, allowing players to avoid potentially dangerous encounters by using the local currency as a bargaining device. Use the C key to confirm your selections, or press the X key to cancel your choices. The magic system is also a slight departure from most common RPGs. You earn mana points as the battle progresses, meaning that most spells can only be cast after several turns. The number of times a spell can be used in each battle is limited, but unused healing spells are cast automatically to restore the health of party members after battle.